Description: Women's meeting held in Library/Administrative building. Description: Recitation of the Rosary before Mass. Description: Group meets in Library. Description: Begin with Rosary in the Church, followed by meeting held in O'Connor Hall. Description: The Queen Isabella Ladies Auxiliary would like to invite all ladies of our parish to come and see what we are all about. You do not have to be related to a Knight to join us. Meetings: 1st Tuesday of each month in the Family Life Center at 6:30 PM. Description: Men and women's meetings held in the Family Life Center classrooms. Description: RCIA will be held on Wednesday evenings. If you are interested in becoming Catholic, just want to find out more, or need to brush up on the Faith, then this is the class for you. We will meet in O'Connor Hall. Description: Recitation of Rosary before Mass. Description: Held in O'Connor Hall unless otherwise indicated. Description: Held in the Church. 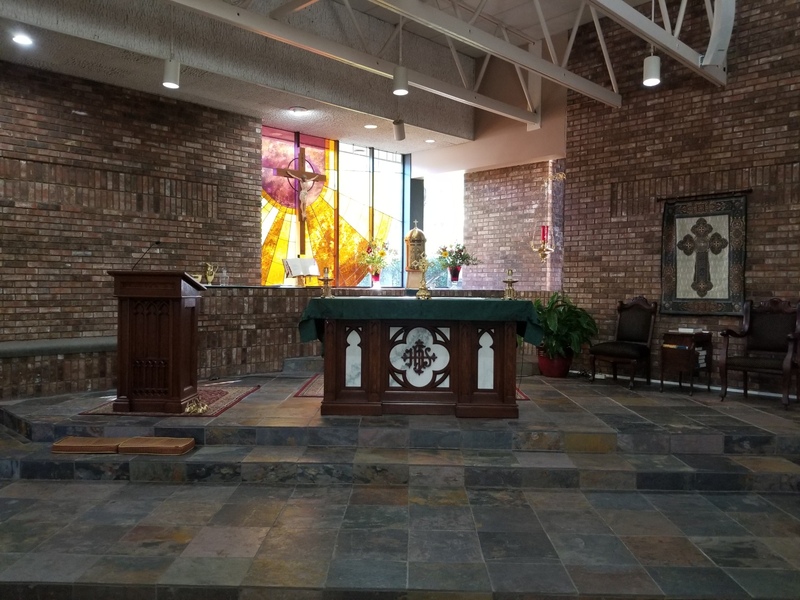 Description: Mass at 8:00 AM, followed with fellowship in O'Connor Hall. Description: Anyone interested in learning more about Divine Mercy may attend. We meet in the parish library each Saturday, 10AM-Noon. The group prays the Divine Mercy Chaplet, reads St. Faustina's diary, the Bible and the Catechism. Contact Francis Peek, 365-0841 for more information. Description: Meets in the Choir Room. Description: Hosted by Ladies Auxiliary after the 8:00 AM and 11:00 AM Mass in O'Connor Hall. Description: Classes held in the Family Life Center. Description: Class held in Family Life Center. Description: Meetings held in Family Life Center. Description: Meeting in O'Connor Hall. Description: Held in O'Connor Hall. Description: Outdoors behind Family Life Center. If inclement weather, will be held in Church. Description: To be held after Stations of the Cross. Description: Normally meets on fourth Monday of each month in the Church Library unless rescheduled. Description: Normally meets in O'Connor Hall on the fourth Tuesday of each month unless rescheduled. Description: Meeting in Family Life Center. Description: Our junior high teens (grades 6th-8th) are invited tio participate. This retreat is free to all our junior high parishioners. Contact Jolynn Coiro, the youth director, if your child would like to attend. The retreat will be held in the Family Life Center. Description: Held in the Family Life Center. Women's meeting held in Library/Administrative building. Recitation of the Rosary before Mass. Begin with Rosary in the Church, followed by meeting held in O'Connor Hall. The Queen Isabella Ladies Auxiliary would like to invite all ladies of our parish to come and see what we are all about. You do not have to be related to a Knight to join us. Meetings: 1st Tuesday of each month in the Family Life Center at 6:30 PM. Men and women's meetings held in the Family Life Center classrooms. RCIA will be held on Wednesday evenings. If you are interested in becoming Catholic, just want to find out more, or need to brush up on the Faith, then this is the class for you. We will meet in O'Connor Hall. Recitation of Rosary before Mass. Held in O'Connor Hall unless otherwise indicated. Mass at 8:00 AM, followed with fellowship in O'Connor Hall. Anyone interested in learning more about Divine Mercy may attend. We meet in the parish library each Saturday, 10AM-Noon. The group prays the Divine Mercy Chaplet, reads St. Faustina's diary, the Bible and the Catechism. Contact Francis Peek, 365-0841 for more information. Meets in the Choir Room. Hosted by Ladies Auxiliary after the 8:00 AM and 11:00 AM Mass in O'Connor Hall. Classes held in the Family Life Center. Class held in Family Life Center. Meetings held in Family Life Center. Outdoors behind Family Life Center. If inclement weather, will be held in Church. To be held after Stations of the Cross. Normally meets on fourth Monday of each month in the Church Library unless rescheduled. Normally meets in O'Connor Hall on the fourth Tuesday of each month unless rescheduled. Meeting in Family Life Center. Our junior high teens (grades 6th-8th) are invited tio participate. This retreat is free to all our junior high parishioners. Contact Jolynn Coiro, the youth director, if your child would like to attend. Held in the Family Life Center.